Courage is telling my story whole heartedly. 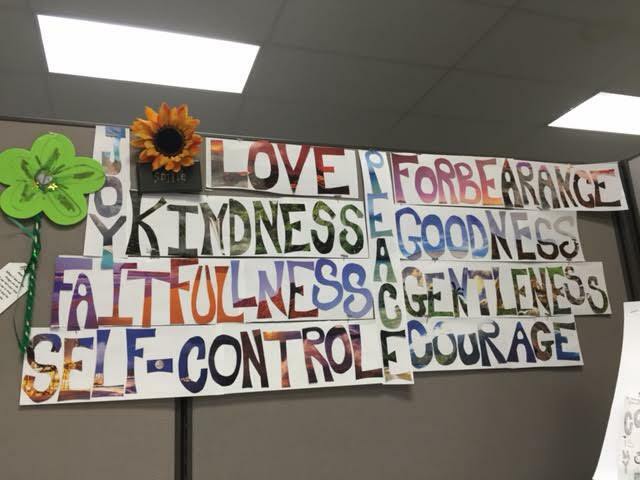 I doodled this definition and hung it on my cubicle wall. I grabbed the calendar and tore out a pretty picture of the beach. 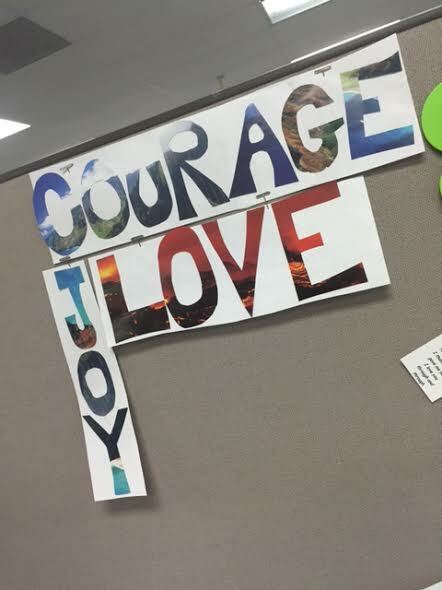 I cut out COURAGE and hung it by my little doodle. My friend Marlo swung by and complimented my word. She said, “I need one that says PATIENCE!” So I made one. I didn’t stop there. I cutout LOVE and JOY. So I cut and cut and cut all week. It was my little project that I would turn to in between the phone calls and the emails and the boring work stuff. It became a beautiful release. Yesterday while leaving the house, I snapped at my son. He peed on the toilet and was lying about it. Both pet peeves. When I got to work I looked at my phone and saw a text message, “stop slamming doors please.” This did NOT go over well in my head. I don’t even remember slamming doors, for the record. I wrote back multiple times without hitting SEND, thankfully! I spewed bad words to my husband and to a coworker and 2 dear friends. I wear my life on my sleeve, I can’t keep my emotions hidden. I turned to people I knew would tell me to let it go, and that it wasn’t even a big deal, and that I was only upset because of the real underlying issues, and that I shouldn’t take it out via text and blah blah blah. I have the best of friends and husband! I started distracting myself to keep me away from my phone. I worked. I put some tunes in my ears. The thoughts kept coming and over powering every effort I was throwing out to get them to hush. Then I had a break in the work flow and turned to my last word. The last fruit of the spirit. SELF-CONTROL. And I laughed out loud, not just lolled…..way to go God! I see what You did there! Very clever. My anger suddenly stopped. Ha go figure! God is cool. These words became a ministry. Marlo asked for patience and it was given. Self control drilled me in the face. It was a co workers birthday and I gave her FABULOUS and she gave me a smile. Then an interesting co worker came by. He was in the army and has a bit of a short temper. He reminds me of the high school quarter back who peaked senior year and is now stuck in a job with a bitter attitude. But I like him, nice guy..sometimes. He complimented me on the words and hinted that I make him one. I choose BE STRONG. As in army strong…because ya know he’s an army guy. He just paid me another visit after noticing the period I cut out and placed at the end. Since his was a sentence and not a word it needed a period. I choose this small little tree hanging on by its roots. It is white knuckle rooting the side of this hill. Strong little thing. He likes the tree. He also mentioned that he once lived in Hawaii, which is the location of the photo words. Connection. God is smiling on us and in us. He is softening hearts. I reorganized my cube today and put my words in a place that all can see as they pass by. I just found the same calendar in a coworkers cube on the verge of garbage death and I saved it. God has 11 new lives to touch with words. The words will come. They always do with time. Have a God-willed week friends. Will, not fill. That isn’t a typo. You, my brothers and sisters, were called to be free. But do not use your freedom to indulge the flesh[a]; rather, serve one another humbly in love. 14 For the entire law is fulfilled in keeping this one command: “Love your neighbor as yourself.”[b] 15 If you bite and devour each other, watch out or you will be destroyed by each other. There is power in the words, “you are welcome.” This phrase was one that was foreign to my mouth until it was pointed out just recently to me that I rarely ever mutter it. This week I made it my task to say these 3 little words. This is a small little, often thoughtless, phrase that people wiggle from their lips on the daily. But darn it, these are important and should be acknowledged! We are taught as children that “please” and “thank you” are worth their weight in gold. We are told to be polite little creatures and to mutter these, even when we don’t feel the need. It becomes implanted in our minds, but not necessarily in our hearts. I don’t ever remember my mom shoving “you are welcome” down my throat and into my vocab. She never taught me to recognize the “thanks you”‘s. Pay attention this weekend my friends. Acknowledge the “thank you”‘s and give them a hearty welcome. Welcome the “welcomes”.